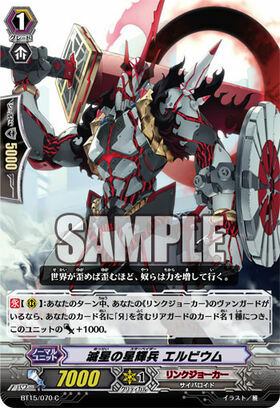 [CONT](RC):During your turn, if you have a «Link Joker» vanguard, this unit gets [Power]+1000 for each different rear-guard you have with "Я" in its card name. "The further the world is distorted, the more power they gain." A member of the vanguard fleet “Star-Vaders” of the invaders known as “Link Joker”. They are the oldest soldiers of the Non-Mass-Produced Cyberoids that participated in the invasion of Cray. Originally Erbium were human warriors with a single-edge sword, but due to a severely advanced corruption by “Void”, they were twisted into horrible, merciless beings without a trace of their former humanity. They are now just a Non-Mass-Produced Soldiers whose bodies contain “Void”. After accepting the power, the pieces of their souls that were left behind were corrupted and they completely lost themselves. Once the mental corruption gets so bad that their former self cannot be recognized, someone corrupted by “Void” has their bodies twisted next. Their bodies are suddenly changed into a far more violent and aggressive form befitting their new soul. Ironically, the power of a soldier who reaches this stage has their power skyrocket. They are result of Яeverse. It’s too horrifying to call this “evolution”, and too harsh to call it “corruption”, but those who have been changed can hardly be called “living things”. It is the birth of a corrupted warrior, the blessing to a soldier without a soul. The vanguards of “Link Joker”, the invaders threatening the planet Cray who are the embodiment of “Void”. Protist-like micro-organisms collected and examined the data of the planet’s strongest, and were further programmed to take control of the bodies of worthwhile subjects, while those deemed useless or weak are to be erased. Among the various technologies and powers unknown to the planet of Cray, one of those is the strange, unknown power called “Lock”.